TAMPA, Fla. -- Show your school spirit with the latest shirts from the College of Arts and Sciences! 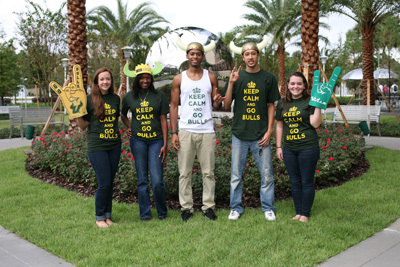 The shirts, available in unisex tank top or T-shirt, will feature the popular phrase, “Keep Calm and Go Bulls.” They are available in youth and adult sizes, and will cost $15. Less than 50 shirts are available for immediate purchase. Once those are sold, the College of Arts and Sciences will begin accepting pre-orders. The shirts will be available for purchase starting Friday, Oct. 5 in front of Cooper Hall from 9-11 a.m. and 1-3 p.m. Pre-order forms and checks can be dropped off to CPR 107, from 8 a.m. to 5 p.m., Monday through Friday. The shirts are purchasable by check or money order only, so please make the checks or money orders out to the “University of South Florida” and fill out the order form. To purchase a money order, you can go to the USF Post Office or a nearby Publix. You can purchase money orders with cash, debit or credit cards.